Interior of the ferry Alakai on its inaugural sail from Honolulu to Kahului, Maui. The Hawaii Superferry sailed off into a sea of controversy yesterday, and a day that started with watchlike precision closed on a sour note after a dozen surfers blocked the 349-foot vessel and its 500 passengers from safely entering Kauai's Nawiliwili Harbor. After a 90-minute delay during which the Coast Guard dispersed the flotilla, the boat unloaded passengers and vehicles and headed back to Honolulu on its second round trip of the day. The surfers' blockade -- which followed a smaller protest on Maui -- came on the eve of a motion that is expected to be filed today in Maui Circuit Court seeking an injunction to stop the Superferry's operation until the state conducts an environmental assessment. Earlier, on a smooth inaugural voyage, the Alakai easily navigated the three-hour course to Maui's Kahului Harbor in a calm ocean that left passengers excited about being part of history.The Superferry jump-started service by two days with offers of $5 fares and free food and drinks for passengers. ABOARD THE ALAKAI » Sailing on a calm day in a sea of controversy, the Hawaii Superferry embarked on its inaugural voyage to Maui yesterday without a hitch. Security: The Coast Guard is implementing security zones during the transit of the Superferry that are circular and extend 100 yards out from the vessel. The security zone will move with the vessel as long as it is within three nautical miles of the mouth of the harbor. Any violation of the security zone is a federal offense and can result in fines of up to $32,500 per violation or imprisonment for up to 10 years. Scenic Views: The Superferry, which currently offers only one outside viewing deck at the back of the Surf Break Lanai, is making plans to provide outside viewing on both sides of the ship -- contrary to its original business plan. The side decks will open within "the next couple weeks." Arcade Plans: The ship's arcade room, vacant yesterday, will be filled "shortly." "We had one system lined up, and we didn't like it so we're moving to another system," a Superferry official said. But its late-afternoon cruise to Kauai proved to be a nightmare after surfers brought the 349-foot vessel to a stop outside Nawiliwili Harbor and forced the Superferry and its 500 passengers to wait for Coast Guard assistance. The ship was delayed for about 90 minutes before the Coast Guard cleared the way. The ferry embarked on the return voyage to Honolulu after a concerted shoreline protest. "Community members on all islands have been looking forward to the launch of this transportation alternative," the company said in a statement last night. "And we are sorry to see that minority dissident groups have chosen to oppose a service that the people of Hawaii have overwhelmingly embraced." Facing a possible court injunction that could suspend operations due to environmental concerns, the Alakai left Honolulu Harbor yesterday morning seven minutes early -- but two days ahead of its previously announced start date -- and arrived at Maui's Kahului Harbor ahead of schedule. Kailua resident Kalena Hayden, one of 500 passengers making the historic inaugural voyage, said that when the water started churning, her "heart rate went up" because the arrival of the Superferry meant she now has another way to visit the other islands. "This is such an opportunity for us to be able to go to other islands, and I know people with wheelchairs who are so looking forward to this because when they have to go on airplanes, they have to be lifted way up," she said. "The only way I would see this view is being out in a canoe, and I prefer this far better than canoeing out here." 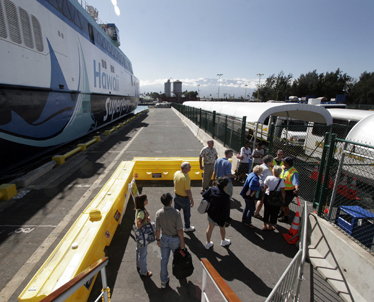 Hawaii Superferry President and Chief Executive John Garibaldi said he was pleased with the efficiency of the morning operation -- from the check-in process to boarding to the on-board experience, as well as the loading and unloading of vehicles. The $5 discounted fare for passengers -- and an additional $5 for vehicles -- resulted in more than 20,000 of the available 22,000 seats being booked within the first 24 hours for the 11 days of the special promotion. "This is a good example of people's support for this project -- whether it's judges, the public or the special-interest groups on Maui, to really see who's speaking for Hawaii," he said. One Kauai surfer, part of about three dozen who blocked the entrance of the Superferry. voices his displeasure to ship staff yesterday. 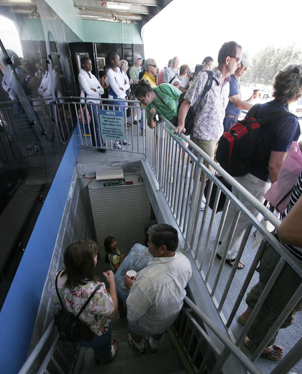 Passengers wait with cars to drive off the ferry as it docks in Honolulu. On Maui a couple dozen environmentalists and onlookers, including state Deputy Attorney General Bill Wynhoff, observed the passengers and cars leaving the vessel. But there was no traffic congestion -- albeit it was a Sunday morning -- and signs of protest were few. Still, those who were there voiced concerns about how the fast-moving (40 mph) ferry could endanger whales, as well as congest traffic and transport invasive species. Irene Bowie, executive director of the Maui Tomorrow Foundation, a sustainable-development advocacy group, said foundation members were there to witness the event, observe the traffic implications and document the number of vehicles coming off the ferry. "We want the environmental review performed before it goes into operation, and we want all the issues -- the implications of invasive species, endangered humpback whales, traffic impact -- addressed before it's in operation," she said. "To have it jump-started today is not what I think the court was looking at, and we're here to see what happens." 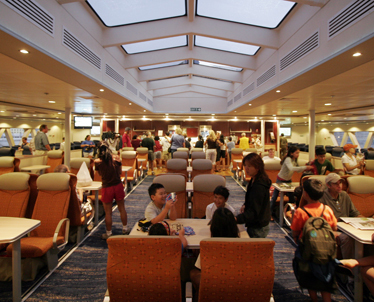 Maui-bound passengers said they believed that the Superferry already had done enough in its own environmental studies. "We've got to protect the environment, and if it makes the whales safer, I'm all for it," said Glenn Morrison, a Honolulu physician. But, having said that, Morrison added that he felt the Superferry already had adequately addressed environmental concerns. "That's why I came on board, because I felt they'd probably taken the steps necessary, and commerce is commerce and boats sail the water all the time," he said. "This is kind of a fast boat, and as long as they have spotters on board, and if they work with the whale people who know where the whales are, there's probably a low chance that there's going to be a problem." 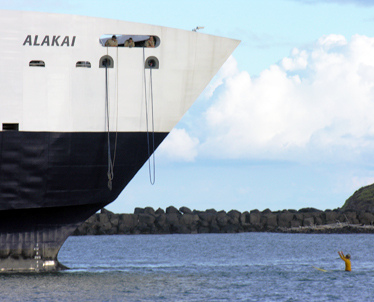 Passengers waited to disembark the Superferry Alakai yesterday at Kahului Harbor on Maui. 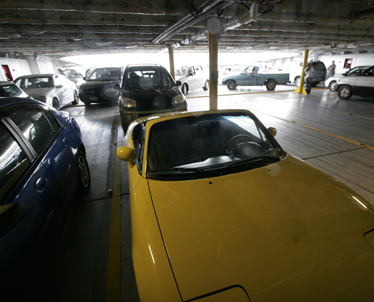 Passengers left the ship before being shuttled to the passenger gate area away from the dock. Jeff Henderson, a Paia, Maui, resident who boarded the Alakai at Kahului Harbor, said he agreed with the environmentalists that all the safety precautions for marine life have to be taken into account. "But where I completely differ from them is that the only transport between the islands right now is by jet plane," Henderson said. "The 30-year-old Aloha Airlines planes are putting more pollution in the air and the environment, and this (Superferry) is going to be cleaner-running than that situation." During the morning cruise to Maui, passengers were treated to complimentary sandwiches and either soft drinks or water because the dining areas were not set up to accept cash or serve alcohol. There also were no games in the arcade area. But the limited passenger count of 500 -- out of a capacity of 866 -- allowed those on board ample room to move around. Those returning to Honolulu from Maui also received either souvenir tote bags or coolers. Also, few passengers suffered from motion sickness. J.F. Lehman & Co. Vice Chairman Tig Krekel, whose New York-based company is the majority investor of the Superferry, said he was not surprised by the overwhelming response. "They want this service," he said. "And if you step back and think about it and put all the lawsuits aside, it's an island community with a ferry system. That's not too unusual."